Choose your L-Shape desktop style from 1" thick bamboo, rubberwood, and GREENGUARD laminate options - all ready to ship quickly! Your desk extension may be placed on the left or right and can be switched later. We recommend installing on the side of your dominant hand. L-shaped desks arrive in two pieces. Start by measuring your office, then choose a length that will fit your workspace. Our L-shaped desktops come in many different styles and colors. Choose fromGREENGUARD-Certified Laminates, 1" Thick Solid Bamboo, or responsibly sourced solid wood Rubberwood. Details and benefits about all available desktop materials are outlined in the UPLIFT Desktop Brochure. Download our spec sheet PDF for more details. L-Shape Desktops help you make the most of your total desktop space, and your your "Optimal Reach Zone." Any desk has parts that are more easily accessed than others. For optimal ergonomics, keep your mouse, keyboard, smartphone, and other regularly used items in that Optimal Reach Zone. Phones, lighting, and other less-used items may be stored in the Maximum Reach Zone. And books and decor that you rarely need may be stored in the Outer Reach Zone. Receive your L-shaped desk even sooner! Just add our expedited production option to your desk order. Place your order by 3 pm Central on a business day and we guarantee to start production and ship your order the same day. If placed after 3 pm, your desk is guaranteed to ship the following business day. The UPLIFT Height Adjustable Standing Desk with L-Shaped Top is a comfortable fit for your computer, papers, and decor. Take full advantage of our sturdy, fully supportive UPLIFT 3-Leg Desk Frame. Choose your own desktop, with solid Rubberwood, 1" thick Bamboo, or black and white Eco styles. Build a corner desk that's the best fit for your office and add the accessories you need to keep your work space clean and comfortable. The UPLIFT Desk was developed to set the standard for quality, looks, and functionality in a sit stand desk. And UPLIFT's larger L-shape desk does all that while offering even more workspace and a design fit for the corner office. You won't find anything more stable than the Height Adjustable Standing Desk with L-Shaped Top, and the reason is UPLIFT's thoughtful frame design. The L-shape's third leg is a contributor, but this desk's stability braces, built into the top of each leg, are the biggest protectors against side-to-side shaking, and eliminate the need for a big metal crossbar at your feet. Noise-dampening pads under your desktop make noise and shaking a non-issue, and ensure the desk moves quietly, at only 46dB. This all comes together into a piece of furniture that leads the industry in support, and looks great doing it! The UPLIFT L-Shape Desk is offered with a number of different desktop types to choose from. Once you know if you need the extension on the left or right side (this can always be changed later), you'll need to decide on the top's look. Moso bamboo, which originated in China and southeast Asia, is an ever-popular choice in modern-style furniture. Moso is one of the strongest bamboo species in the world and grows to maturity in just five years, making it an incredibly sustainable resource for furniture. Our bamboo is grown without the use of pesticides or chemical fertilizers, constructed without chemical stains or dyes, and finished with a water-based German UV coating for added protection. This creates a natural look and a resilient desktop we know you'll love. GREENGUARD-certified laminates make for that more traditional feel, in solid blacks and whites. They are simple, quality desktops that are both scratch- and water-resistant. And, the GREENGUARD certification is a must-have when you're considering a laminate. This process ensures the tops are safe for use indoors and do not emit chemicals like formaldehyde, which can be harmful to breathe. UPLIFT does not offer laminate products that fall short of these important standards. Rubberwood desktops are made from the trees that produce latex rubber and, despite the name, are one of the more resilient hardwood species available. The wood is harvested at the end of the tree's life to ensure that the process remains environmentally friendly, and produces a desktop that is solid wood throughout, all for an unbeatable price. All of the UPLIFT L-Shape desktops are a full 1" thick, making them thicker and sturdier than many other desks available. And when they rest on an UPLIFT frame, they will be well supported for years of regular work, no matter which style is right for you. The UPLIFT desk design is centered around a three-stage frame. Sometimes considered an upgrade over more common two-stage frames, three-stage frames offer a 33% faster travel speed (1.57"/second vs. 1.18"/second), 33% greater range of adjustments (between 24.4" and 50.0" tall, before adding a desktop), and include motors built into each leg that run quietly at 46dB. These desks are more reliable than their two-stage counterparts or desks with external motors and offer an industry-leading lift capacity of 535 lbs. Loading up your desktop with monitors, CPUs, or storage will not slow you down or affect performance in the slightest. UPLIFT's frame is also optimized to prevent side-to-side wobble even without the use of a large under-desk crossbar. Crossbars are needed to help stabilize most desks, but UPLIFT accomplishes stability with a unique stability brace design. Using legs that get thicker near the top allows stability braces to be attached just under the desktop, creating a firm connection and keeping your under-desk space free of crossbars and other obstacles. Adding an Advanced Digital Memory Keypad opens up even more capabilities, starting with one-touch height adjustments. Four height memory buttons can each be used to store a height in the keypad's memory. Just press the button and your desk will automatically move to that height at any time. You won't need to hold anything down, or remember that perfect height, though the keypad's digital display will still show it to you. The keypad also includes several built-in safety features, like UPLIFT's superior anti-collision protection system. When desks can move on their own, it's possible that they might bump into you or your belongings on the way. UPLIFT takes measures against that and ensures the desk will reverse direction immediately if any light resistance is found while adjusting. Keypad lock takes things a step further, and can keep the desk from adjusting at all when you don't want it to. And there are a number of other options you can program to your preference, including maximum and minimum heights, inch vs. centimeter measuring units, and more. Prefer to skip the bells and whistles? That's OK, too. Even without the Advanced Keypad, the UPLIFT Desk comes with a simple up/down arrow controller, for smooth and easy height adjustments. How did you come up with desktop sizes for the corner shaped desks? These desktops have been pre-cut and stocked in our best-selling and most popular sizes. If you want a more custom corner desk and don't mind waiting, check out our custom laminate and solid wood corner desks. Can I order this desk with an Eco Desktop? Currently, we do not have Eco desktops formatted into this particular L-shape design. But there is another option! Take a look at the UPLIFT Eco Corner L-Shape Sit-Stand Desk for an L-shaped black or white Eco desk. Can I order an L-shaped Laminate Desk in a custom size? Yes, of course! Just visit our Custom Laminate L-shaped Desk listing and take a look at the different laminate colors. Then contact one of our Sales Pros, who will be happy to write up a quote for the pricing of a custom sized top. Are there any more color choices than the ones offered here? We can custom make a laminate desktop in your desired color choice. Just contact one of our Sales Pros for a price quote and assistance. How do I clean my corner desk? The laminate top has a degree of chemical resistance and therefore it is okay to use a Lysol wipe. For bamboo and rubberwood desktops, it is best to use a soapy, damp rag to clean up any spills. Just be careful to not leave any water sitting on the desktop, as this can damage the wood's finish. How much space is there between the two pieces? The two desktop pieces will stay together with a pair of support brackets. The holes for the support brackets come pre-drilled into the underside of the desktop so that the two desktop pieces will be flush when your desk is assembled properly. Is there any way for me to get the grains in the bamboo to go the same direction on both pieces of my L-shaped desk? Unfortunately, we do not have the ability to match the grains at this time. The grain on all of our rectangular bamboo desktops runs lengthwise with the desktop. 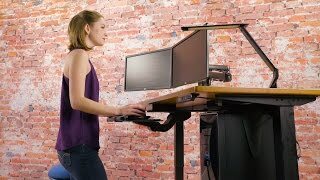 Will I get added strength if I use a 4-leg frame on my L-shape desk? We do not recommend the 4-leg frame on this configuration. Though you get an extra leg of support, it is difficult to ensure that the entire load of the desk is evenly supported across all 4 legs of the desk with this corner-shaped desktop. Can I get a curved corner? If you want an L-shaped desk with a curved corner cutout check out our Custom Laminate Corner Desk or the UPLIFT Eco Corner L-Shape Sit-Stand Desk. Does the advanced keypad offer one-touch height adjustment? Yes! You can enjoy one-touch height adjustment when you order your L-shaped desk with the Advanced Keypad. Which is more durable: rubberwood, bamboo, or laminate? Bamboo, rubberwood, and laminate are all very durable and it is hard to say that one is more durable than the other. Laminate is more resistant to moisture and spills if that is a top priority to you. Bamboo is pressed into a solid surface and you don't have to worry about it splitting over time. Rubberwood is strong enough to support most desk setups. If you have any questions at all, please call us and our Sales Pros can help you decide which top is right for you. Can I get a sample of the bamboo, rubberwood, or laminate desktops before I buy? We do not offer samples of our bamboo, rubberwood, or laminate finishes. You can see all of our desktops on display in our Austin, TX, showroom. Where does the bamboo come from? Our desktops are crafted from Thai and Chinese Bamboo that is pressed together to form a durable desktop. We carbonize the bamboo, which gives it a beautiful honey-caramel finish that you're sure to love for years of use. How hard is this desk to assemble? Assembly of our corner desks is slightly more involved than assembly of our two-leg desks because you have more pieces to deal with. However, our instructions are very detailed and will walk you through the process. You can also check out our 3-Leg Desk Assembly video to see the process. What's the deal with UPLIFT Desk's three-stage desk frames? UPLIFT Desk frames are three-stage frames vs the traditional two-stage desk frames on the market these days. This means their desks are 33% faster and have a 33% greater adjustability range, so desks fit shorter users and kids, and even very tall users or those who plan on adding a treadmill to their setups later. How many motors does this come with? All UPLIFT Desks come with a motor in each leg. Three-leg desks come with a trio of motors so frames are stronger, quieter, safer, and more reliable than desks that work with a single motor. I bought the advanced keypad. When I touch one of the presets my desk only moves a fraction of an inch - is there something wrong with my keypad? Your memory presets are probably working just fine! You probably just have an older control box. To recall your preset heights, you have to press-and-hold the memory setting until your desk reaches standing height. This is for safety, since the older UPLIFT 3-Leg Frame did not have the ability to sense an obstruction and stop. If you see the number 99.046.14.0070 printed on the sticker located near the power socket, then your control box is capable of one-touch memory preset function and may need to be reset - see our Programming Your UPLIFT Desk PDF for instructions on locking the keypad, changing the memory presets from one-touch to press-and-hold, and setting new lower or upper height limits. I live outside of the US, will this desk work with my outlets and voltage? All UPLIFT Desks are designed and made to run on the United States electricity standard of 120V. If you're ordering one of their desks from outside the United States or Canada, you'll most likely need to plug your desk into a step down transformer first, otherwise you run the risk of overloading your desk's control box, which would not be covered by the UPLIFT Desk warranty. Please reach out to our support team if you have any questions about voltage and your desk. How do I tell what kind of control box is on my desk? You can quickly check to see which version of control box you have by glancing at the silver label on it. If that sticker says v4.1, v4.2, or v4.3, then you have the newest version of UPLIFT Desk's control box, which boasts a few new features. The latest version of UPLIFT Desk's control boxes comes with several exciting new safety features, like Collision Sensitivity, Keypad Lockout, and the new ability to toggle between One-Touch and Constant-Touch modes with only a few buttons. If you want more info, you can read about what new features come with these boxes and how to use them on our blog post about the subject! For safety, UPLIFT Desk designed their latest version 4.1 control boxes to be able to be locked so children and unwanted users cannot adjust it when this feature is activated. To lock the keypad, press the "M" button for 5 seconds until the LED switches to "LOC", then press and hold the "M" button to turn on the lockout feature. To unlock it, just press the "M" for 5 more seconds. I ordered it at lunchtime Tuesday, it arrived at dinner time Thursday. We assembled it in a couple hours Friday night. We are extremely happy with the desk, the form, fit and function is excellent. Other than a few minor nitpicks (needs skirts over the casters, wire management tools are less than overwhelming) it is a solid performer at half the price I had budgeted for a competitor. $1,195.00 List Price: $2,495.00* The list price is the same as the MSRP (Manufacturer's Suggested Retail Price). It may not necessarily be the price at which the product is sold.